I'm not sure if it's the Ferber method or just the fact that R doesn't like sleep time, he always puts up a fight right before bed, and today was no different. After his bath at 7 he was put into his cot at 7:10 and as soon as he was in his cot he started to protest , and thus began the crying. 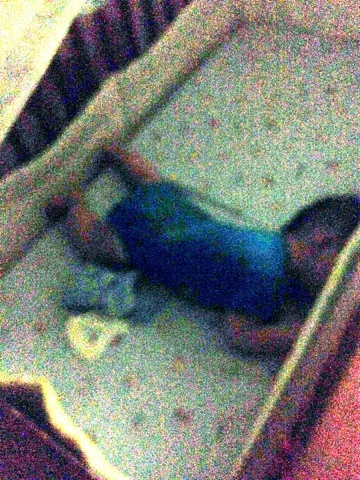 7:15 I checked up on little R and upon sensing my presence he got a bit more upset and cried harder. I rubbed his belly and tried to comfort him and left after a bit. The crying continued but I could tell he was giving up as his cried became fainted and long moments would pass before he gave a yelp. 7:22 - after 5 minutes of silence then yelp, it finally became just silence, although again his sleeping position is all weird, but too afraid to repeat last nights episode, I let him be, after all if he wasn't comfortable he's at the age where he can completely move to any position he desired. 9:15 supper time for R, the little guy fell asleep straight after his meal without a peek. 3:34 little R woke up and cried lethargically and I wondered if I should leave him or feed him but decided to feed him as he was making his hunger calls. He fed quickly and went back to sleep.